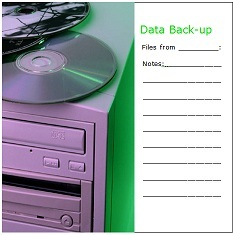 The CD Cover Template to the right is the front side of the insert below which includes a place to insert date of the cd data backup and notes to be able to write in exactly what kind of data is on the cd. The back side of the insert includes the same information except with edges for the spines of the cd to include the cd title and date. The CD Data Backup Insert for the front of the cd should be 4.75"x4.75". The back of the insert is 5.906" with 0.25" on either side for each spine x 4.625". Do you work on a computer in your church office, home, work or business? If yes, then you need some sort of systematic backup for your organization's data. The simply truth is accidents or disasters happen and can take many very important forms along with it. There are natural disasters such as tornadoes, hurricanes and earthquakes, and then there are computer generated disasters such as hard drive crashes which can destroy all your data and your business as well. There are so many evil people in the world today that are crashing computers everywhere. You can back up your office forms or data by simply burning a CD or DVD with essential and important files. Backing up your data can also be done with a flash or jump drive if you prefer or if you need a larger storage capacity. If you decide to use the CD or DVD option then the Backup Data CD Cover below will be very useful for you to organize your backup system. All you need is blank CDs or DVDs, Jewel CD cases and Card Stock paper. Important Note: Email files are not included as data and are not a part of the process of backing up your data files. When you are ready to print the CD Data Backup insert, place white stock paper or any color you prefer into your printer and print. Then you can simply cut them out and place them in the Jewel CD cases to have them ready for the CDs or DVDs in your data backup office system. Included in the Church Forms CD (All Forms, Certificates, Brochures, Flyers...on FreeChurchForms.com) is a blank cd cover template where you can add any text or graphics you prefer for any kind of CDs. Return to Home Page from CD Inserts for Data Backup.